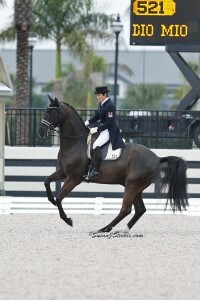 Wellington, FL – February 16, 2013 – With the sun making its first appearance since competition started, the Florida Dressage Classic CDI-W presented by USPRE Association began to wind down today at the Adequan Global Dressage Festival (AGDF). 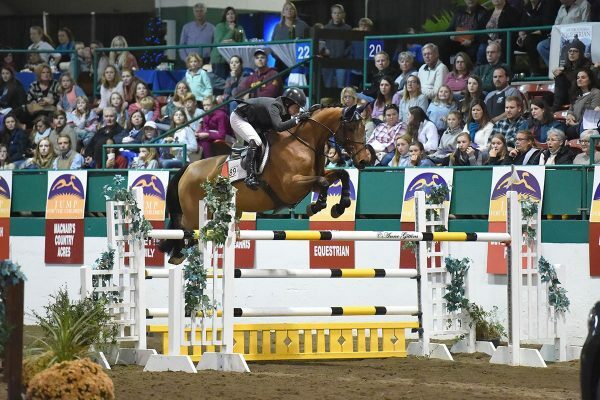 In the Small Tour, Christilot Boylen (CAN) was triumphant, taking the top two spots in the $5,000 FEI Intermediare I sponsored by Havensafe Farm. In the Large Tour, Tinne Vilhelmson-Silfven (SWE) clinched the win in the $10,000 FEI Grand Prix Special sponsored by USPRE Association. 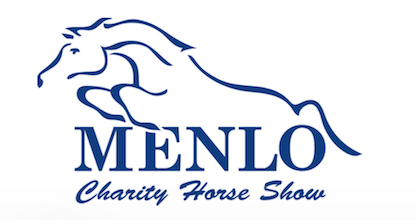 Judges today in both the FEI Intermediare I and FEI Grand Prix Special were Gary Rockwell (USA) at E, Sandy Hotz (USA) at H, Jean-Michel Roudier (FRA) at C, Jacques Van Daele (BEL) at M, and Jennie Loriston-Clarke (GBR) at B. While Boylen won first and second again today, the horses exchanged placings compared to yesterday’s results. Riding 9th of the 17 entries, she and Dio Mio (De Niro x Charmeur) held onto the lead with a score of 71.289%. 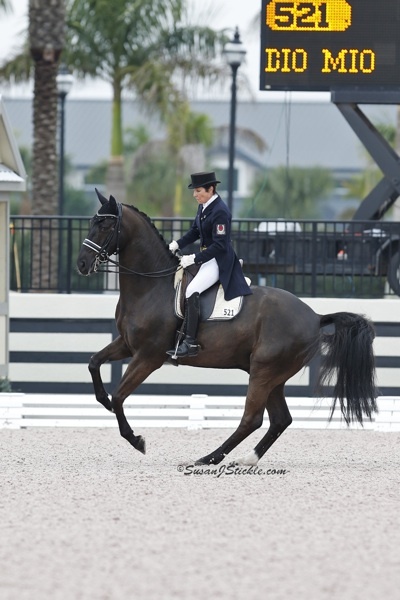 Scoring a 69.395% with Hudson 18 (Hohenstein x Democraat), Boylen couldn’t be more pleased with Jill Irving’s 10-year-old black Hanoverian gelding, Dio Mio, and Hudson 18, the 9-year-old bay Oldenburg gelding. “The second day is always better for Dio Mio. He was a little unsettled yesterday so today the edge was just right. He was much more concentrated. He’s a year older than Hudson and therefore more experienced. He can lay down a clean test when he’s focused, which he showcased today,” she stated. The Canadian Olympian continued, “Hudson is still quite green, this was only his third run through this test in a show condition. He’s still learning, so his lines weren’t perfect; he’s still learning this test. 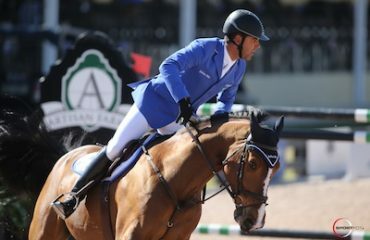 It’s definitely a step up from the Prix St. Georges, but he did his job very well. He listened to me and concentrated. 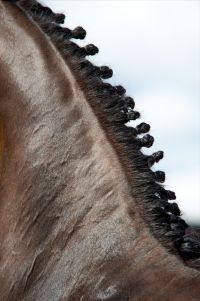 The difficulty for him is he’s such a big moving horse so he needs to improve on tightening up the lines a bit. They were both well-behaved. Each are gifted horses; I count myself extremely lucky every day,” assessed Boylen. Their score today was Vilhelmson-Silfven’s highest ever with Don Auriello in the Special. Although there was not a lot of atmosphere, she still was able to “get him moving just using my aids. 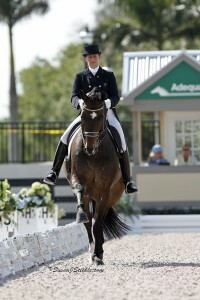 He is just so nice to ride in the tests and that’s a great feeling,” she said. 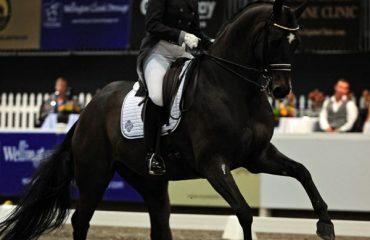 The two started competing in Wellington in the Intermediare II the winter after they bought him at age eight. Anton, as he is affectionately known, “won’t compete until April (at the Reem Acra World Cup). The next few weeks before leaving here to go home (to Sweden), he gets some time off from dressage. We will keep him fit and we will begin training again once we’re home,” explained Vilhelmson-Silfven. The Florida Dressage Classic presented by USPRE Association draws to a close tomorrow, with the featured class being the $6,000 FEI Intermediaire Freestyle. 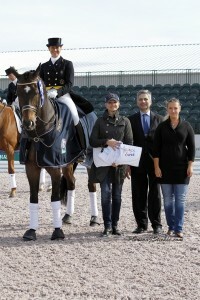 For full results and more information, please visit www.globaldressagefestival.com. Photo Credit: Photos © SusanJStickle.com. These photos may be used only in relation to this press release and must include photo credit. 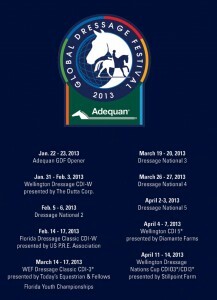 The Adequan Global Dressage Festival (GDF) is one of the world’s largest international and national dressage circuits featuring five CDIs, including a 5*, the first non-championship CDIO Nations’ Cup in the Western Hemisphere, and nine U.S. national events.The Adequan GDF is offering more than $275,000 in prize money for the five international competitions making it one of the richest circuits in the world. 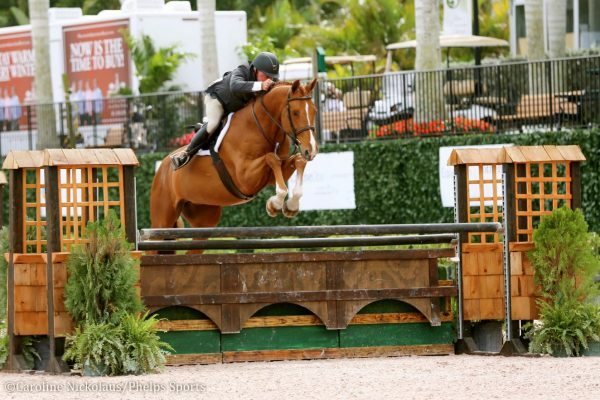 In addition to the CDIs with national competitions, the Adequan GDF will feature six separate national shows to be held at the Stadium section of the Palm Beach International Equestrian Center (PBIEC) show grounds. 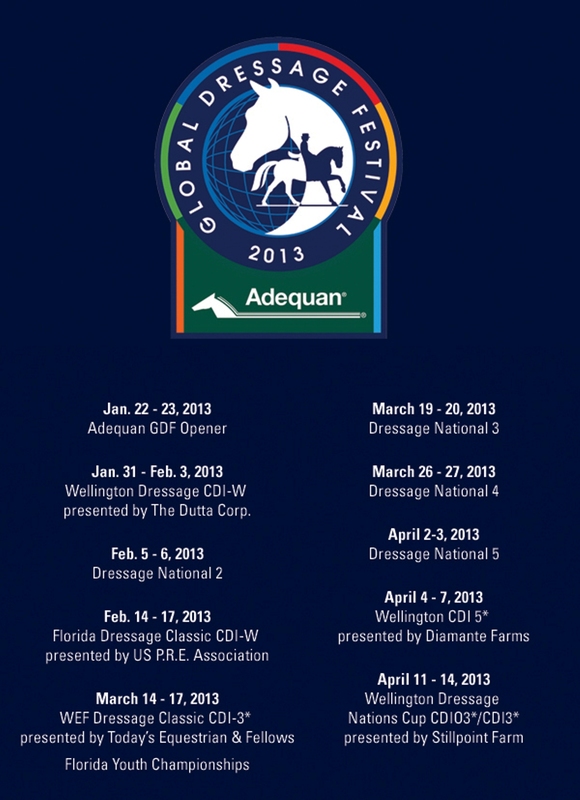 The Adequan GDF encompasses almost 60 acres of the former Palm Beach Polo Grounds. 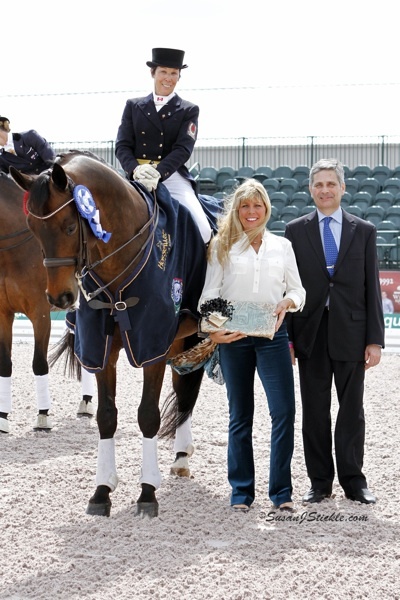 The facility includes the Van Kampen covered arena (made possible by Kimberly and Frederic Boyer and family) and four outdoor arenas with world class footing, 200 permanent stalls, and a VIP seating area for the International Arena fully catered for relaxing and having an enjoyable experience. 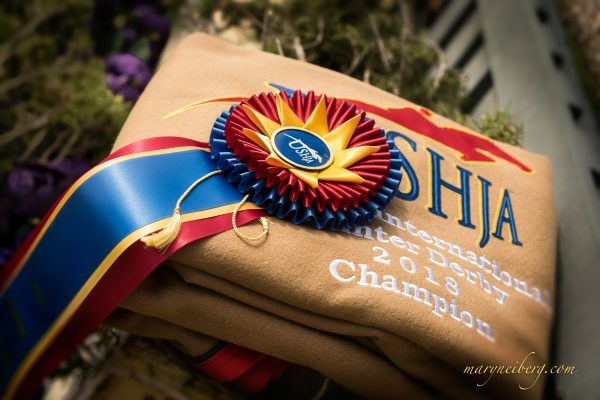 Founding Sponsors: Ashley Holzer and Diane Fellows, Today’s Equestrian; Bethany Peslar, Everglades Dressage; Betsy Juliano, Havensafe Farm; Carol and Rebecca Cohen, Two Swans Farm LLC; Janne Rumbough, MTICA Farm; Mike & Roz Collins; Suhail and PJ Rizvi, Peacock Ridge; and Tim and Susie Dutta, The Dutta Corp.